Mike Monk drives a rare, sporty derivative of the classic Giulietta, Alfa Romeo’s first the model aimed at the mass market. 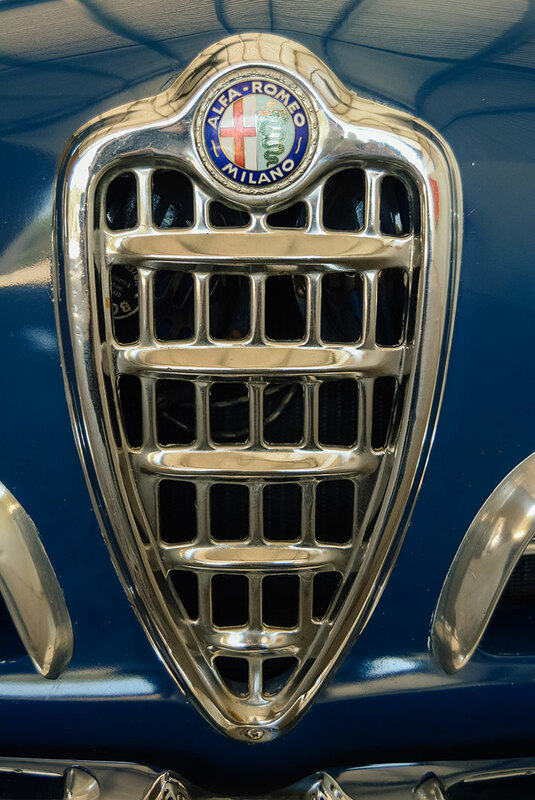 The 110-year history of Alfa Romeo is riddled with ups and downs, yet somehow it manages to survive and maintain a charisma that marketers of rival makes could only look on with a touch of envy. 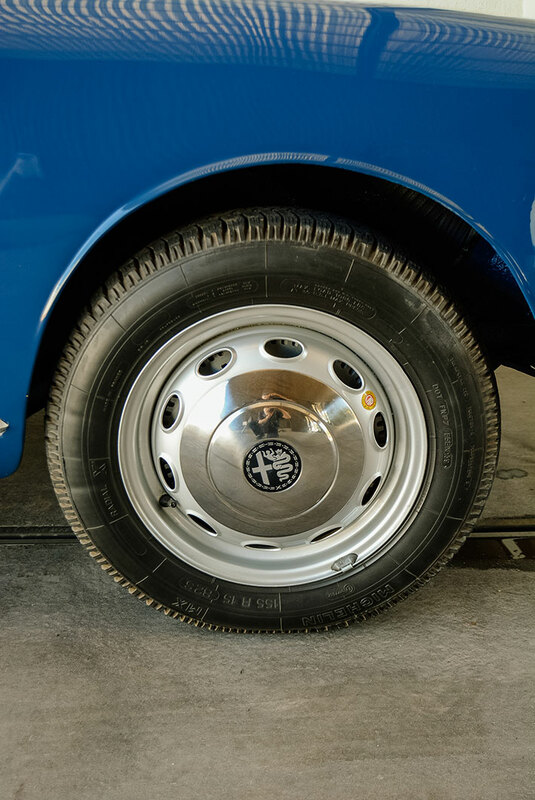 There were a number of factors that led to the charm; some superb designs from a number of Italy’s most talented stylists combined with success in international competition helped establish an aura of style and sporting spirit – ‘cuore sportivo’. But for the most part the company’s products were targeted at a more well-to-do clientele, but this changed in the aftermath of WW2. With the conflict over and the world settled back into peacetime living and financial stability, there was an increase in population and a call for affordable private transportation. To meet the demand, most manufacturers looked to producing smaller, cheaper vehicles. 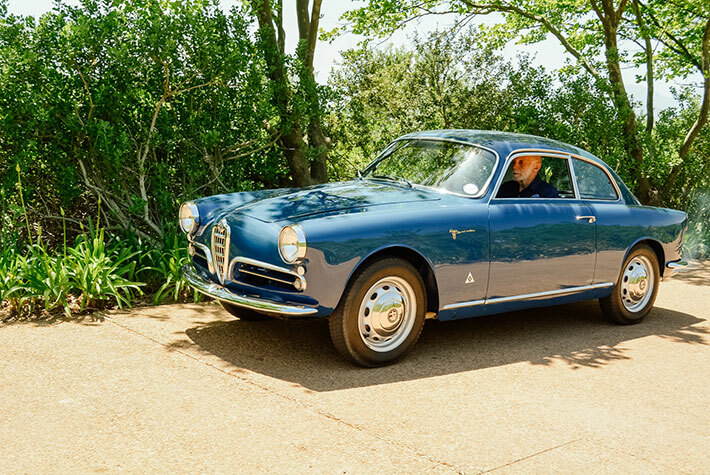 Alfa Romeo was no exception, and under the guidance of design chief Orazio Satta Puliga, the Giulietta concept was conceived, aimed at putting the company’s established technological know-how into a smaller package. ‘Satta’ was also responsible for re-organising the production system along modern lines, as he believed that cars had to offer ‘good performance, reliability and low cost’. He was particularly good at space efficient designs. 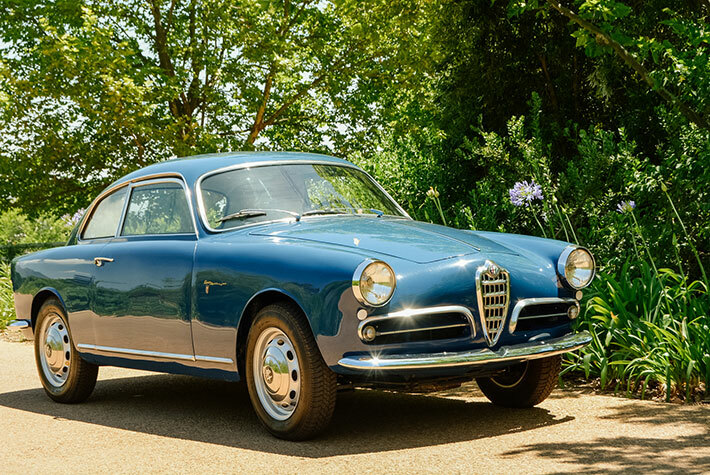 The Giulietta was a turning point for Alfa Romeo – it was the company’s first car aimed at the mass market, and the first to have a name rather than a cipher or a number. 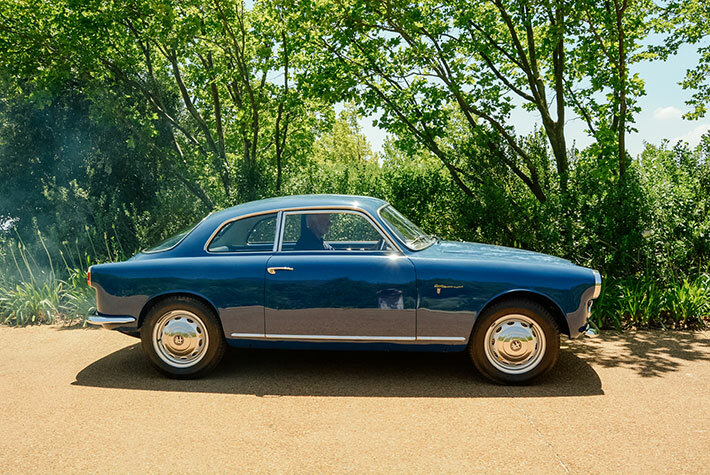 The first Giulietta was a compact two-door 2+2 Sprint coupé, and from Satta’s base design, Bertone’s chief designer and engineer Franco Scaglione finalised the shape. Front suspension was made up of control arms with coaxial coil springs and hydraulic dampers. The solid rear axle was located by a longitudinal link on each side, and a wishbone-shaped arm linking the top of the aluminium differential housing to the floorpan. Springing was by coils springs and hydraulic dampers. Brakes were large-diameter finned aluminium drums at all four corners. 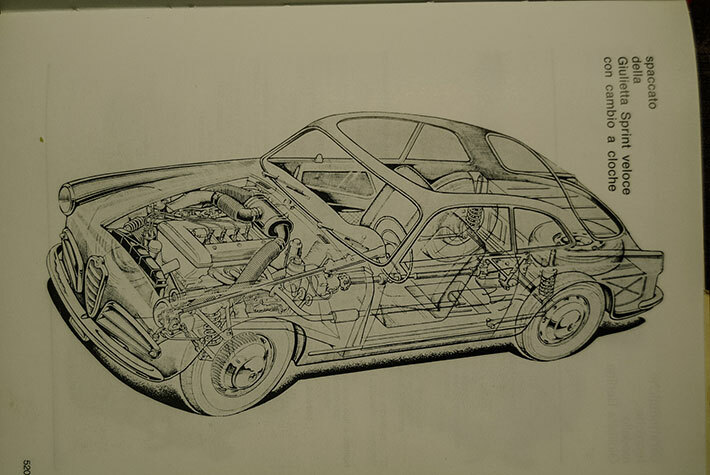 But not only was the Giulietta a downsized car, its new engine, designed by Giuseppe Busso, was also a small capacity design – but full of engineering excellence. 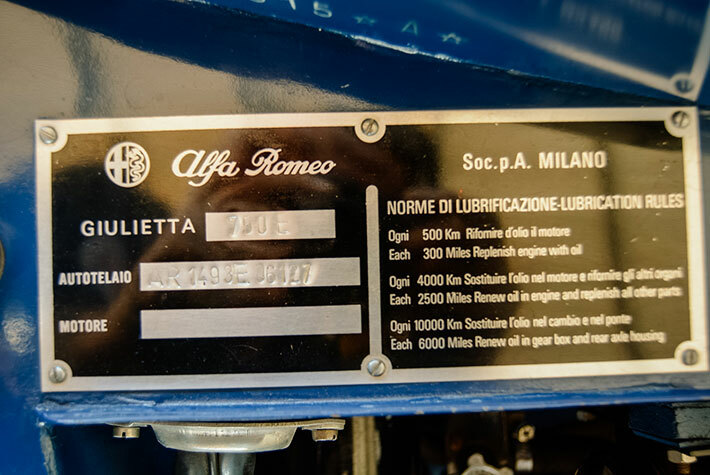 The all-aluminium twin-overhead cam motor was the forerunner of what was to become Alfa’s staple engine for the next four decades. 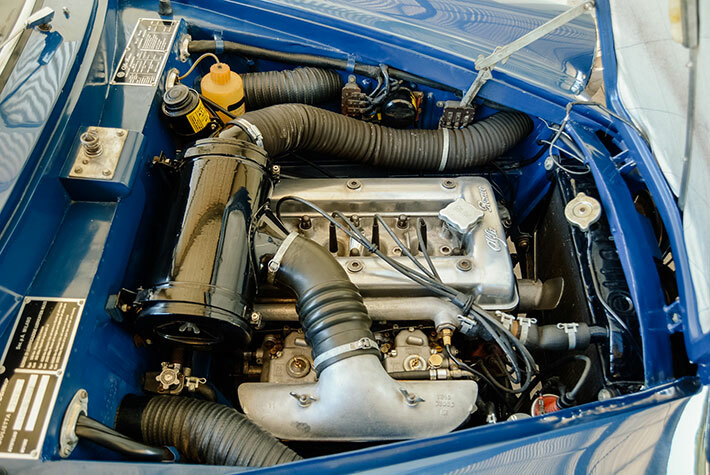 In initial guise it had a swept volume of 1 290 cm3 and with a single twin-choke downdraught carburettor and an 8,5:1 compression ratio, it developed 59 kW at 6 300 r/min. 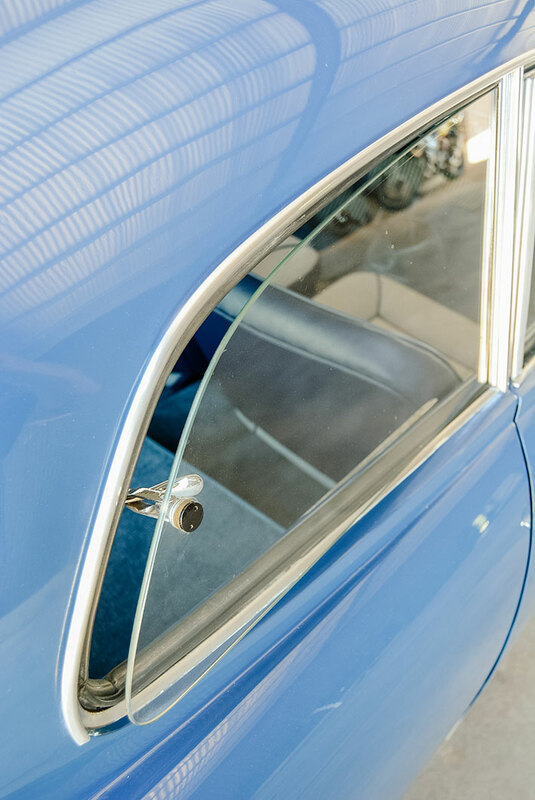 Rumour has it that Bertone – who were entrusted to build the car – only finished the prototype 20 days before it was launched at the 1954 Turin Motor Show, where it was an instant success. The elegant design, sporty performance, comfortable ride and excellent handling – all at an affordable price – soon had showrooms filled with eager-to-buy customers. At the 1955 Turin Motor Show it was joined by the 4-door Berlina and later in the year by the open two-seat Spider, featuring convertible bodywork by Pininfarina. A limited-edition, aerodynamic Sprint Speciale coupé designed by Scaglione appeared in 1957 along with a more powerful Giulietta TI Berlina. A couple of very limited production station wagon models appeared, too. In 1956 a lightweight Sprint Veloce appeared with dual twin-choke sidedraught carburettors that helped realise 66 kW at 6 500 r/min and raised top speed to 185 km/h. In 1957 the Sprint Zagato arrived offering 74 kW at 6 500 r/min and a top speed of 193 km/h. 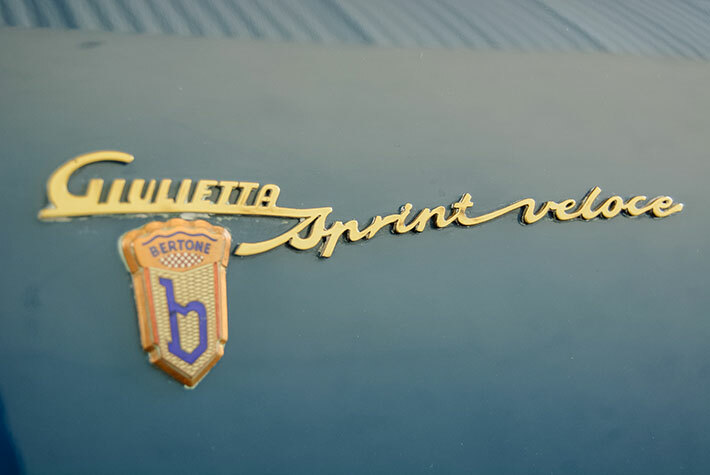 The Sprint Veloce was discontinued in 1957 and replaced with the Confortevole, which featured the Veloce’s 66 kW engine in the Normale body. Other identifying features include aluminium window frames and wind-up windows. Underneath, a Veloce-spec rubber buffer fitted to prevent the sump from hitting the frame rail. 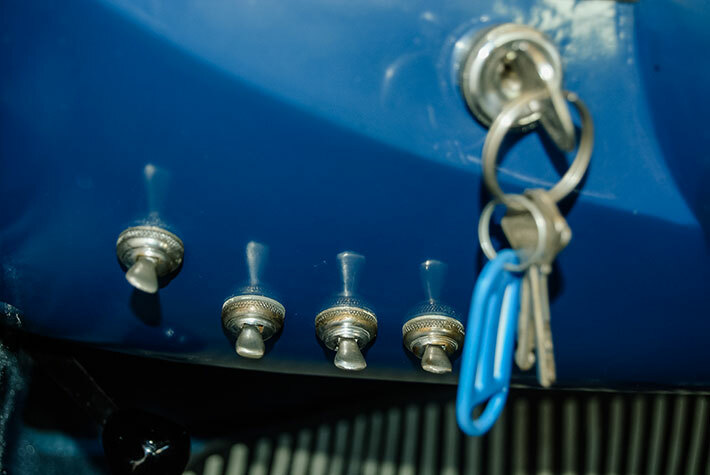 All Confortevoles had the same mechanical spec as the Veloce. FMM’s left-hand drive car featured here carries Alfa’s body number 750E AR1493E 06127 and left the line on 20 Feb 1958. Only 50 of these cars were produced, identified on the Bertone body number plate with an *A* suffix, in this case 655515*A*. Getting into the Sprint is easy but there is always a fear that for tall, long-legged drivers such as myself that the fabled Italian long arm driving position would hamper driving comfort. The seat’s backrest angle is fixed but there is plenty of fore/aft adjustment and the steering wheel angle is fine, so no problem really. The pedals are noticeably offset towards the centre of the car, but their skew location is not problematic. 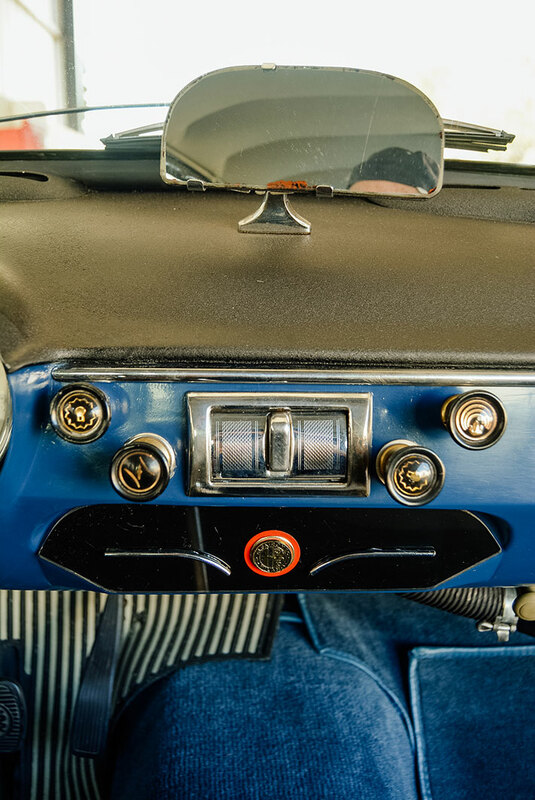 The motor fires up with a characteristic crackle that was a trademark of Busso’s design. 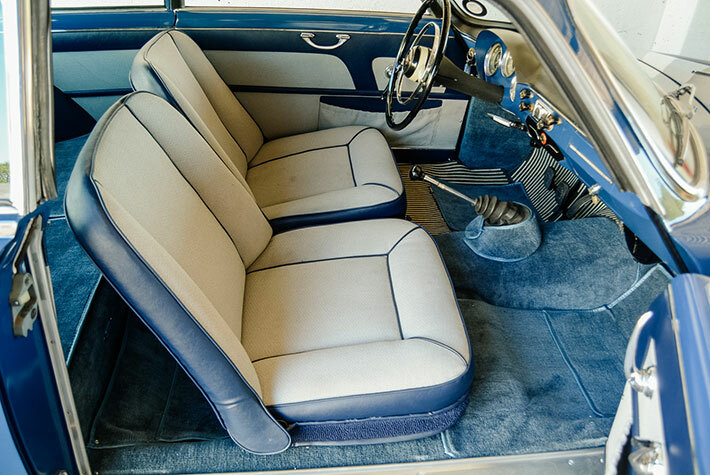 At launch, the Giuliettas were fitted with an all-synchromesh four-speed aluminium gearbox with a column shift, which was replaced by a floor shift in 1957. 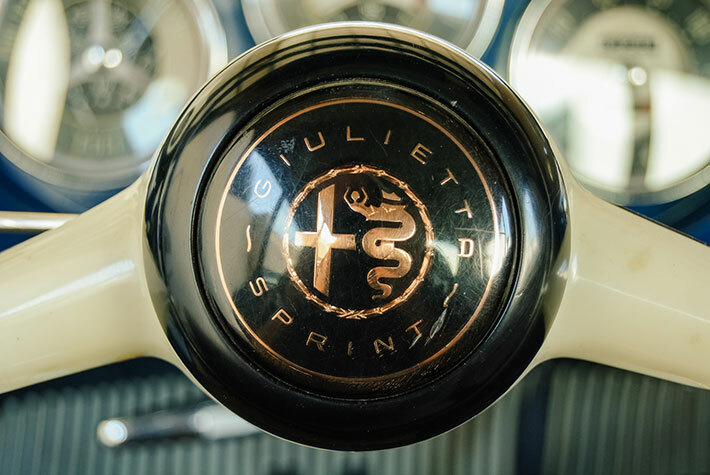 The five-speed ’box only appeared in 1962 towards the end of the Giulietta’s 11-year life span. At some time in its life, this car has inherited a five-speeder, an acceptable conversion from standard. 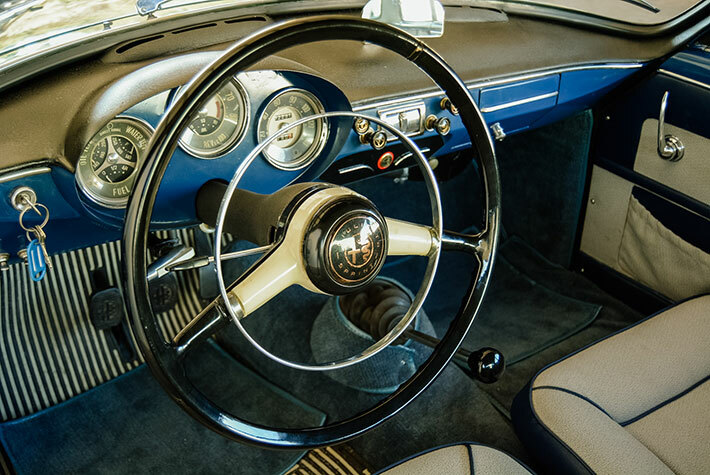 The facia is simply laid out with a trio of comprehensive instruments set into a single pod behind the two-spoke two-tone steering wheel (with horn ring). 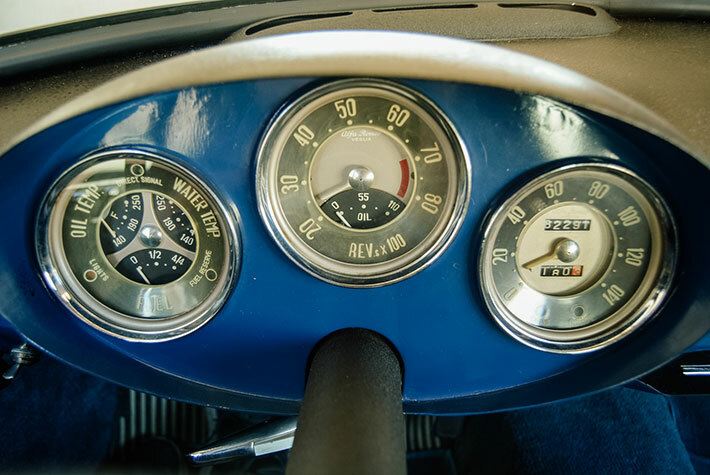 Centre stage goes to the rev-counter with in-built oil pressure gauge. To the left the fuel, water and oil temperature gauges are grouped together, while on the right is the speedometer reading to 140 km/h. On the road, the Giulietta’s famed driveability is soon apparent, making for a thoroughly enjoyable experience. It is strictly a two-seater; in place of the standard Sprint’s +2 rear seats is a split flat shelf, the two halves of which can be lifted off to reveal some storage space to supplement the already good-sized boot. 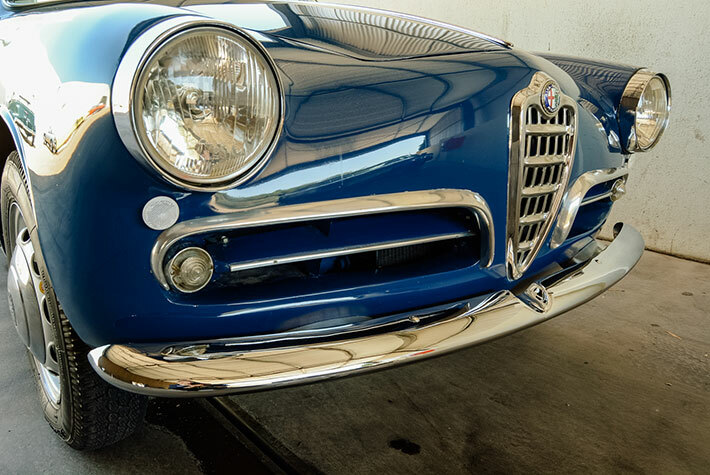 In 1959 there was a minor facelift and the model series code changed to 101, but the combined 750E/101 Series Giulietta was the Little Jewel in Alfa Romeo’s post-war history. 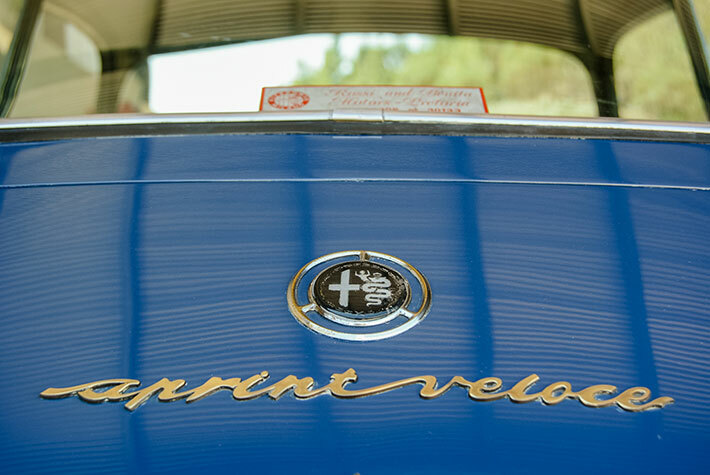 The first of the breed, the Sprint, set the standard on what was to become a golden era for the otherwise often troubled Italian automaker. Its timeless design and superb road manners make it a classic of note and driving the Confortevole adds just a little bit of exclusivity to the experience.